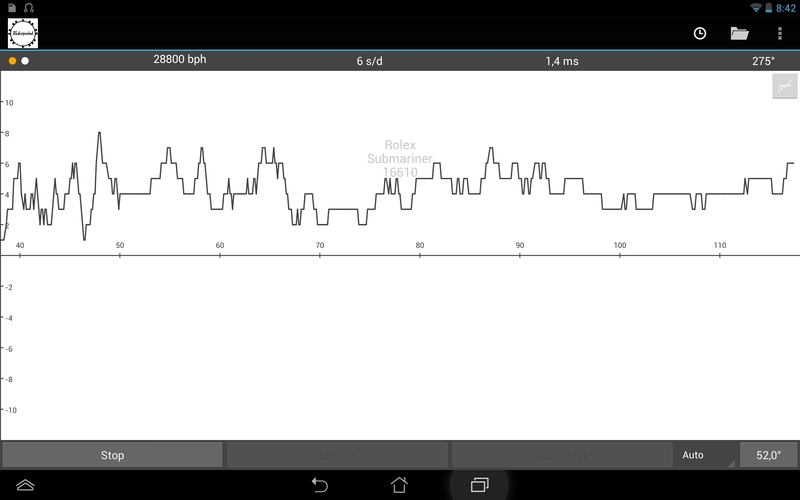 Tickoprint is a very good watch analyzer being realized as an app for smartphones. Reliable results I have achieved with the microphone and amplifier combination recommended on the TICKOPRINT® website. I have tested the Pro version of this app. I compared various mechanical pocket watches and wristwatches with different smartphones, also in comparison with another watch analyzer. The quality of the test results seem to depend on compatibility of the microphone and the microphone input of the particular smartphone. Very good results I have achieved with a relatively cheap device (LG Optimus L4 II / Android 4.1.2). The User interface, functions and selectable options are very good and professional. This application is very recommendable and I am looking forward to get the Premuim version. Mit Tickoprint ist es gelungen eine sehr gute Zeitwaage als App für Smartphones zu realisieren. Wirklich gute Ergebnisse habe ich mit dem auf der TICKOPRINT® Website empfohlenen Kombination Mikrofon + Verstärker erreicht. Die App habe ich in der Pro-Version getestet. Ich habe verschiedene mechanische Taschen- und Armbanduhren mit unterschiedlichen Smartphones und auch im Vergleich mit einer anderen PC-Zeitwaaage verglichen. Die Qualität der Prüfergebnisse hängt anscheinend von dem Zusammenspiel des Mikrofons mit dem Mikrofoneingang des jeweiligen Smartphones ab. Sehr gute Ergebnisse hatte ich mit einem relativ günstigen Gerät (LG Optimus L4 II / Android 4.1.2) erreicht. Die Darstellungen, Funktionen und die Einstellmöglichkeiten der App sind sehr gut und professionell. Ich kann diese App nur empfehlen und bin schon gespannt auf die Premium-Variante. Tickoprint PREMIUM (to be released pretty soon) has a new addtional tick noise waveform display which offers deeper analysis of the entire escapment system for damaged pallet stones and other, hard to discover defects. While running the test the display shows the single ticks, after finishing and saving the test data the entire test can be replayed on the screen, the entire test duration can be selected and displayed by moving the display window back and forth by swiping with the fingertips from left to right and vice versa. 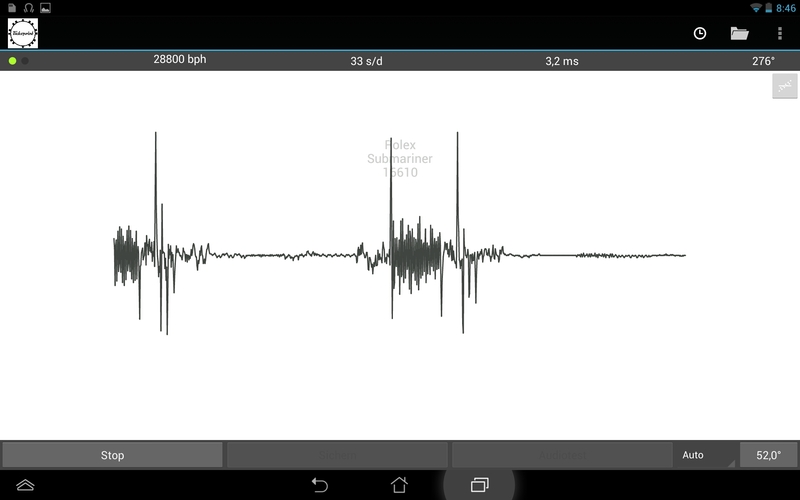 Playback of the tick noise from the saved test data. The display window may be moved forth and back by wiping with the fingertips from left to right and vice versa. The above images shows the single tick noise whle the test is running. After the test has been finished all test data can be saved and played back. Tickoprint PRO already offers the addtional TRACE display which shows the single ticks and the current tick deviation without harmonizing the test values to compute the average accuracy, beat error and amplitude. I have been dabbling a bit with the Tickoprint software for ANDROID and it works pretty good! I did take the financial HIT and invested the price of a cinema ticket for the professional version and that was probably the best buy I ever did when it comes to watch tools and tingamajiggers. I run it on a NEXUS 7 pad with a cover that you can fold out so you can have the pad standing up on its side and that works very well. I did some experiments with microphones and one stands out as an alternative for those who tinker with clocks in here as well, namely a pick up for an acoustic guitar. A triangular contraption you clip on inside the sound hole of the guitar and a plug that fits in guitar amplifiers. WAY to fat for the Android, but you can get an adapter. Probably at the music store you bought the pick up in. I have timed a small tower clock with this thing, clamping it on to the frame of the clock. Since the pick up only takes up vicinity vibrations and not actual SOUNDS, it works like a charm. I tried a BUNCH of microphones but the problem with them all is that the Tickoprint can sometimes be confused by ambient sound. The best result I had was to pack in a small microphone I used for an electronic stethoscope some time back, in Rodico to the back of a pocket watch and that worked reasonably well, when it was completely covered in Rodico. Now, I have an old original Tickoprint that has been decommissioned for ages. It has this handy dandy anvil type stand with a holder for watch movements and a VERY tempting, but incompatible, plug on a cord sticking out. Has anybody out there done any conversion for that? With wishes of a great 2014! Now you can download TICKOPRINT here! TICKOPRINT (R) 1.0 has been released via Google Play. Visit Google Play to download your free version of TICKOPRINT! 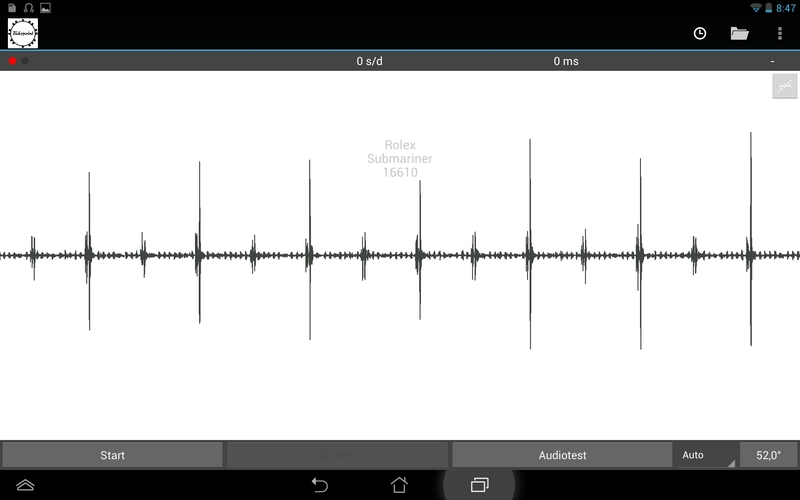 TICKOPRINT has sophisticated routines for signal detection, signal acquisition and signal processing and therefore can be run basically with the standard head set which came with your ANDROID(TM) device. But for proper and more precise results and to eliminate all environment noise an external body sound detector is necessary. This body sound microphone can easily be assembled with some cheap components available at various suppliers. 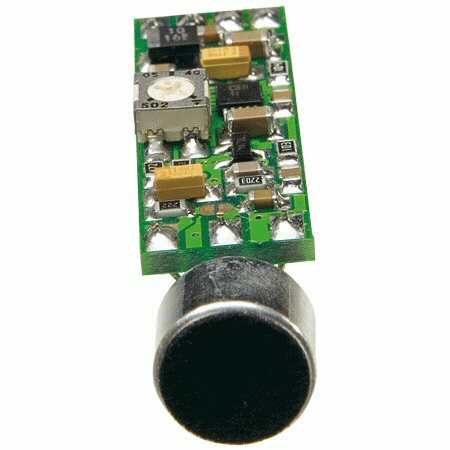 A simple and inexpensive piezo buzzer, which also can be used as a body sound microphone, for example like this. Please take care for a medium voltage model (~9-12V). 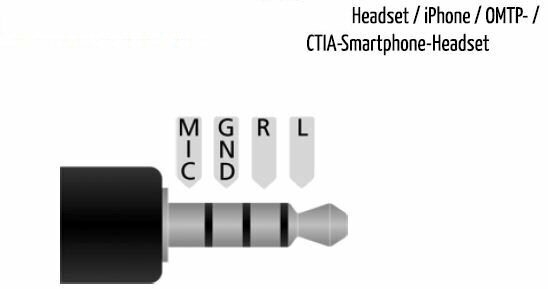 A jack to fit into the head set connector of your Android(TM) device, commonly (on majority of the devices) a 4-pole, 3.5mm RCA jack like this, but you should check your own device. A soldering iron or a friend with a soldering iron, a plier to cut the cable and some solder. Solder the shield of the cable to the „GND“ pole as shown below, and one core of the cable to the „MIC“ pole as shown below. Connect the other end of the cable to the thin cables which are attached to the piezo buzzer. That’s it! The more sophisticated users can use a microphone pre-amplifier, too. We have achieved perfect results with this type. It easily connects to a piezo buzzer and increases the signal quality dramatically. Please notice that the microphone capsule on the photo which is part of the supply is unnecessary and can be dropped. We are still working on a cost effective TICKOPRINT mic pre-amp which will be shipped ready-to-use. More to come soon after our design work for this add-on has been finished. TICKOPRINT is on the final for being released within the last weeks of 2013. The tremendous support by the Beta users group has lead into major improvements in usability, accuracy and functionality of TICKOPRINT which has made it easier to use and by increased functionality. To make TICKOPRINT easily usable in all major countries it has been translated into German, English, French, Spanish, Russian, Japanese and Chinese language. We are happy to announce that the final release candiadte is planned to be published pretty soon. All newsletter subscribers will be notified when the time has come for downloading the free version of TICKOPRINT for Andoid(TM). The Beta test has started! The TICKOPRINT beta version has just been sent to our group of beta testers worlwide. We are very excited that – after more than eighteen month of hard work – we have achieved this important pre-release state and we are very curious about the feedback we will receive pretty soon from the members of our beta testers group! You will frequently being updated about the ongoing release process of TICKOPRINT! We are releasing the ALPHA version (inofficial release for alpha testing purposes) of TICKOPRINT within the next two weeks. The version is published only for a closed group of beta testers. The maximum member count of the beta tester group has been achieved today within a couple of minutes. The group will be supplied with the Alpha release of Tickoprint pretty soon. Subscribe to our newsletter to get updates of the ongoing release process of Tickoprint! Subscribe to our newsletter and we’ll keep you updated about Tickoprint’s progress in getting published. As one of our „early adopters“ you’ll have the chance to apply to our Beta tester program which will supply you with a full working licence of Tickoprint Premium with lifetime updates for free!